The Cotswolds Scenic Drive, England | Classic Driving Route, Top Sights! The Cotswolds is a popular area for tourists to explore when visiting the UK. It is most famous for its fantastic natural scenery and authentic villages. The drive from Cheltenham to Stratford-upon-Avon, or vice versa, is not a long one and will take less than one hour to complete. Of course, when you book your rental car, you may want to allocate extra time in this area for stopping, eating and taking in the sights. Whether you start in Cheltenham or make it your final destination, make sure that you allocate some time to spend here before you move on. The most popular attractions in Cheltenham include a walk through the Montpellier District, a scenic trip on the Gloucestershire Warwickshire Railway, the Cheltenham Town Hall and the Holst Birthplace Museum. There are also parks, sporting complexes and theatres in the area. Cheltenham has something for everyone to enjoy. Stratford-upon-Avon is most well-known as the birthplace of William Shakespeare. As a result, you will find many Shakespeare-related attractions and sights here. 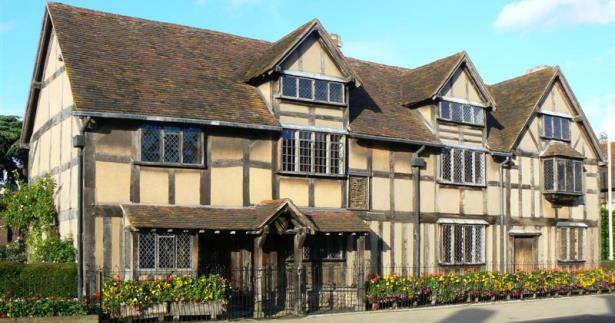 The Royal Shakespeare Theatre, Anne Hathaway’s Cottage & Gardens and Shakespeare’s Birthplace are all top tourist attractions. There are a number of other theatres, parks, museums and historic sights to be visited as well. The main sights along the way include the various quaint villages, the beautiful meadows decorated by colourful wildflowers and lovely towns like Chipping Campden. These friendly towns make the perfect place to stop, walk around and enjoy the views as well as a packed lunch. The main attractions in this town include the Hidcote Manor Garden, Kiftsgate Court Gardens, St. James’ Church and the Court Barn museum to name just a few. If you decide to take a slight detour along the way and visit Evesham, you can enjoy a stroll by the River Avon, visit the Almonry Heritage Centre, the Evesham Country Park or perhaps even go on a fabulous and relaxing river cruise. For people visiting Birmingham, Bristol, London or other smaller towns in the area, this drive is a great way to explore the country and get out of the city. Whether you choose a one way car rental in the UK or you are making a round trip, you should definitely plan your drive, the sights you want to see and where you would like to spend each night of your vacation.